For some time now Mac users have often opted for an iMac with all the upgrades for their workstation rather than the Mac Pro since it’s latest re-incarnation in the “dustbin” case has been shunned for it’s lack of upgradeability. Apple has caught onto this fact and has promised to revamp the Mac Pro line (watch this space), in the meantime Apple has decided to launch the iMac Pro range due to launch later this year in December. 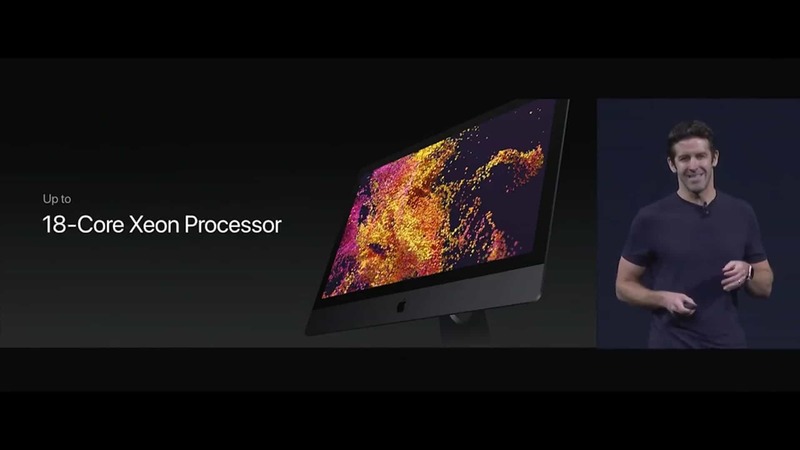 The iMac Pro Range will offer upto 128GB of RAM and up to 18 cores with a The Radeon Pro Vega GPU with up to 16GB of video RAM. Those of you who have seen inside the iMac 27” will see the speakers are different in the above image, that’s because Apple have added an all new speaker system which promises broad frequency response, rich bass, and more volume. Which cannot be a bad thing the current iMac range already sounds great to me although I am no audiophile. 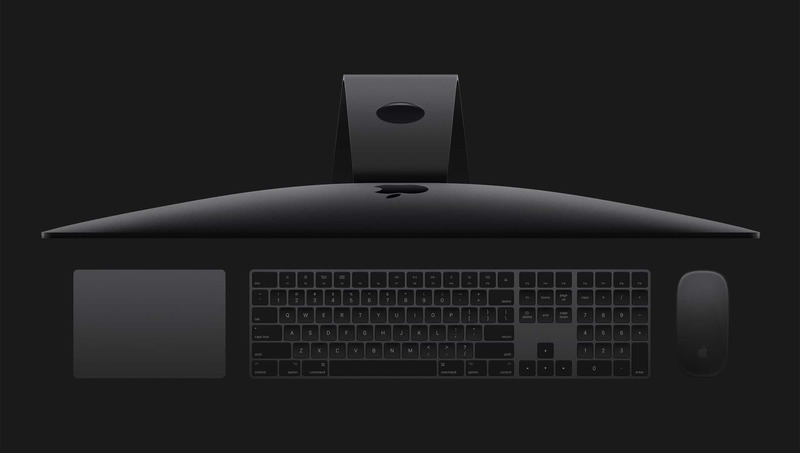 iMac Pro will also have a new space gray colour although Apple are promising to keep its dimensions within the size of the current 27” models. The price tag will be high, but when you add up the cost of the components and screen the price is more than justifiable and not that much more than a custom rig built with the same components. It was back in 2009 that Apple first introduced the iMac 27-inch ( iMac11,1 with Core i7 (860) “Wolfdale, Lynnfield”) with an i7 processor the performance of these iMacs was so strong that people who were buying a Mac Pro simply for speed started look to the iMac instead myself included. Up until the Mac Pro mid 2012 power users could still be swayed by the upgradability of the Mac Pro vs the iMac , and the fact the Mac Pro still could be configured with more powerful processor options than the iMac with the iMac still limited to a maximum 4 cores. This only appealed to a very small number of users. The resulting revamp of the Mac Pro in 2013 left us with what has been dubbed the “trash can” design which is both aesthetically pleasing and technically brilliant. However it has the massive downside of being a form over function design albeit brilliant from an engineering perspective. The current Mac Pro has limited upgrade options only the SSD and RAM are easily upgradeable and most professionals love to upgrade. Mac Pro’s in their current form have not had a processor upgrade in nearly 4 years and again this is not something you can upgrade yourself easily and you are limited to one CPU socket. Most annoyingly the proprietary graphics cards couldn’t be upgraded unless Apple released new versions something that has not happened. Fear not if you are a Mac Pro aficionado Apple did announce in April of this year (2017) that a 3rd Generation of Mac Pro would be released in 2018 or 2019. Apple has already lowered the price on the higher-end Mac Pro options. Which is usually a sign a new model is coming soon as Apple clears their existing stock. This is speculation but I would expect to see a whole new design for the 3rd generation Mac Pro as the current shape of the Mac Pro has prevented it from being updated. Apple have acknowledged that the new Mac Pro design will be “modular”. As well as new processors, I/O , and GPU’s , I hope to see the new Mac Pro come with upgradeable GPU’s and CPU’s and again I may be swayed back to the Mac Pro from the current iMac line up.